asylum. We will bring an english translation of the articles soon! This is the Result of the press conference in Frankfurt Germany. We will fights against any inhuman laws. To hell racist Dublin regulations II&III. 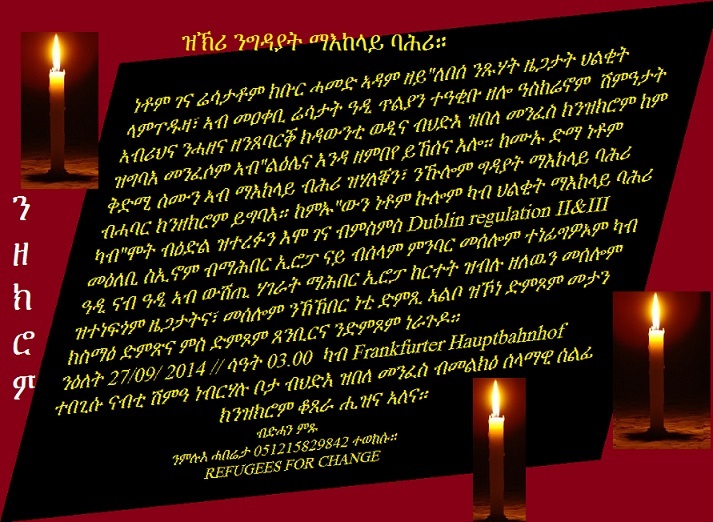 Demonstration, June 7th: Refugees For Change – We are here to stay! How much longer do we have to protest for our rights? Is there any justice? Who will answer our call? We have been tired for years, but we are still fighting for our rights. Why are we being marginalized and discriminated? What is the meaning of democracy? When we were in our countries of origin, we knew the difference between democracy and dictatorial regimes. Today, when we analyze the great European Union, things are a lot more complicated. We hope that there will be an end to our suffering soon. Because we believe that helpless refugees should not be persecuted or punished in democratic countries. Stop deporting hopeless refugees to the lawless countries inside the European Union. Stop the racist Dublin II and III regulations. ስለምንታይ ግን ተረሲዕናን? ብሕብርናን ዲና ብድኽነትናን ተናዒቕናን?